Go to Transect - AquaCalc stores up to 9 separate stream transects. Go to Observe # - Takes you to one of the 99 stations (or stream positions) that can be stored for each transect. Next Observe - Moves to the next station location in the transect. Measure - Starts the automatic measurement process. Observe Depth - Used to select the vertical meaurement position for a station measurement, when needed. 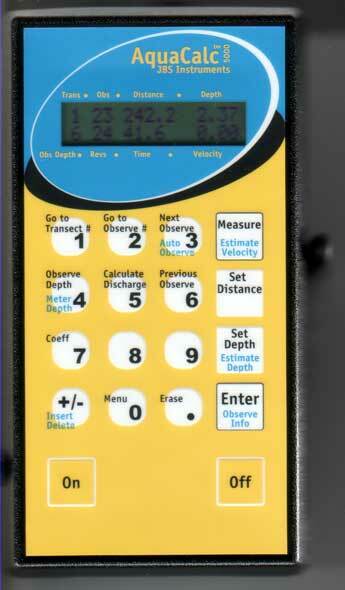 Calculate Discharge - Displays total stream discharge at the touch of a button. Previous Station - Moves to the previous station in your transect. Set Distance - Press this button to set the distance of the current measurement along your tag line. Coeff - When needed, a cosine adjustment compensates for measurements taken that are not parrellel to stream flow. Or enter a method coefficient which can adjust for other factors. Set Depth - Press when you want to enter the depth of the measurement. Hold to enter an estimated depth. +/- - Used when entering a reverse stream flow. Set Up - Puts you in the set up mode, for customizing the way the AquaCalc operates. Erase - Used to delete all of the entries in a transect. Enter - Used to complete the entry of numbers. On - Turns on the AquaCalc..
Off - Hold down for three seconds to turn it off. The AquaCalc display showing the details of an Observation in Transect 1.